Durham Connects. Durham Connects is a brief, universal postnatal nurse home-visiting program designed to assess family needs and connect parents with community resources to improve infant health and well-being. Important aims are to alleviate parent substance use and other problems and to prevent child abuse. Designed for population-level implementation, it engages every family but rapidly triages and concentrates resources on families with assessed higher needs. The highly structured program consists of four to seven scripted intervention contacts, beginning with consent during a birthing hospital visit when a staff member communicates the importance of community support for parenting, one to three nurse home visits when the infant is between 3 and 12 weeks old, one to two nurse contacts with a community service provider, and a telephone or home follow-up 1 month later. In a population-level randomized controlled trial with almost 5,000 families, families assigned to Durham Connects had 50 percent less emergency medical care use across the first 12 months of life than the control group. This population-level program yields similar benefits to other, more intensive nurse visiting programs that have found reductions in service usage in infancy (Dodge et al., 2013b). Early Steps, Family Check-Up (Early Steps FCU). Early Steps FCU is a brief selective intervention designed to support families with young children (ages 2 through 5) who may experience stress due to income or other family circumstances. It is a brief (three-session) family intervention that consists of an initial parent interview followed by family assessment and a feedback session; there is an option for additional follow-up sessions on parent management support using an empirically validated curriculum (Everyday Parenting). Early Steps FCU aims to improve parenting practices, increase the involvement of caregivers with children, and link parents to support services with the goal of preventing the development of childhood problem behaviors. A benefit of this intervention is that it works with individual families to identify specific needs and strengths, thus tailoring the intervention to each family’s needs. To test the Early Steps FCU, participants were identified through a national family nutrition and health program for young families referred to as the Women, Infants, and Children Nutrition Program (WIC). Early Steps FCU resulted in reduced problem behaviors, especially among the highest risk children. This effect on child behavior was accounted for by improvements in positive parenting. The Early Steps FCU was also found to be associated with attenuated internalizing behavior, increased self-regulation, and improved language skills among children and reduced depressive symptoms in mothers. This highlights that prevention interventions can improve parenting practices and reduce problem behaviors in children, and improve parental functioning (Dishion et al., 2008). Family Spirit. Family Spirit is a pregnancy and early childhood selective prevention intervention for American Indian teen mothers and their children, delivered by Native paraprofessionals (local workers trained and supervised by professionals to deliver the program) in home visits. Sessions target parenting skills across early childhood (0 to 3 years), maternal substance abuse prevention and life skills, and positive child psychosocial development. The program consists of 43 highly structured lessons, occurring weekly through pregnancy, biweekly in the first 3 months after childbirth, monthly between 4 and 12 months, and bimonthly between 12 and 36 months. Recent findings for the Family Spirit intervention showed that, at 12 months postpartum, intervention mothers had greater parenting knowledge, parenting self-efficacy, and home safety attitudes with fewer externalizing behaviors (opposition/defiance, rule breaking, and social problems) than the control group. Their children also had fewer externalizing problems. In a sub-sample of mothers with any lifetime substance use at baseline, children of substance users in the intervention versus control group were found to have fewer externalizing and dysregulation problems, and fewer scored in the clinically "at risk" range for externalizing and internalizing problems (Barlow et al., 2006; Barlow et al., 2012). Nurse Family Partnership. Nurse Family Partnership is a selective prenatal and infancy home visitation program for young first-time mothers from low socio-economic backgrounds and their children through age 2. The program’s primary goals are to improve the outcomes of pregnancy by helping pregnant women improve their health, for instance through diet and discontinuing cigarette, alcohol, or other drug use; to improve children’s subsequent health and development by promoting competent parental caregiving; and to improve parents’ economic self-sufficiency by helping them develop a vision for the future of their families and to make appropriate decisions about completing their educations, finding work, and planning the timing of subsequent pregnancies. The program consists of 64 structured visits beginning as early in pregnancy as possible and continuing through the first 2 years of the child’s life. Nurses adapt the content and frequency of visits to meet families’ needs and aspirations. Findings on this program have confirmed that the Nurse Family Partnership (NFP) intervention produces a broad array of positive effects on immediate and intermediate outcomes, including improved maternal, infant, and child health and reduced injuries, neglect, and maltreatment of children. There are also long-term effects on child outcomes. For example, children in the NFP intervention group had lower rates of substance use, delinquency, and involvement in the juvenile justice system at age 12 than control group children. This intervention is effective with diverse populations (e.g., rural and urban) but not as effective when implemented by trained paraprofessionals; hence, nurse participation is a key aspect of this intervention (Kitzman et al., 2010; Olds et al., 2010). Multidimensional Treatment Foster Care for Preschoolers (MTFC-P) (Formerly Early Intervention Foster Care [EIFC]). MTFC-P is a selective intervention for 3- to 6-year-old children in foster care. It attempts to create optimal foster care conditions (including providing responsive and consistent caregiving and predictable daily routines) to facilitate developmental progress and address difficulties related to delayed maturation and behavioral and emotional problems. Children are referred from the child welfare system by their caseworkers. The intervention is delivered by family therapists and licensed psychologists who provide parenting training and access to resources for foster parents above and beyond those offered in regular foster care. Prior to bringing a new foster child into their home, foster parents receive 12 hours of training during which they learn how to concretely encourage pro-social behavior, consistently and non-abusively set limits to address disruptive behavior, and give children close supervision. Foster parents attend weekly support group meetings and have frequent telephone contact with intervention staff, including access to a 24-hour crisis hotline. The children receive weekly individualized skills training services from a child therapist and attend a weekly therapeutic playgroup. In addition, family therapists work with families to facilitate the transition out of foster care and into a permanent home. Children in this early intervention foster care program showed more secure behaviors, improved response to feedback, and improved sleep. They also showed reduced stress, measured by the level of the hormone cortisol. Over the course of MTFC-P placement, children’s cortisol levels normalized and became similar to those of a control group of non-maltreated children living with their biological parents. Another measure of child function among children in foster care is disrupted placement, with children who function better staying in a placement rather than being moved to another foster home. Successful transitions into permanent homes were significantly higher for children in the early intervention foster care program compared to children in regular foster care (Fisher et al., 2007; Fisher et al., 2009). Caring School Community Program (Formerly Child Development Project). This is a universal family and school intervention to reduce risk factors and bolster protective factors among children making the transition to elementary school. The program focuses on strengthening students’ “sense of community,” or connection to school, which research has shown to be pivotal in reducing drug use, violence, and mental health problems and promoting academic motivation and achievement. The program consists of a set of classroom, school, and family involvement approaches that reinforce the development of skills by children across contexts. These promote positive peer, teacher-student, and home-school relationships and the development of social, emotional, and character-related skills. The program provides detailed instructional, implementation, and staff development materials. Research results showed a significant reduction in students’ drug use and involvement in other problem behaviors in schools where the Caring School Community Program was widely implemented by teachers over a period of 3 years, compared to schools not implementing the program (Battistich et al., 2000). Classroom-Centered (CC) Intervention. The CC Intervention is a multi-component, universal first-grade preventive intervention targeting early aggressive or disruptive behavior and poor academic achievement, with the long-term goal of reducing adolescent and adult antisocial behavior and substance abuse. The CC Intervention enhances teachers' behavior management and instructional skills through the use of an effective classroom behavior management program called the “Good Behavior Game” and an enhanced reading and mathematics curricula. Results from an ongoing follow-up study indicate that the CC Intervention decreased the level of conduct problems in middle and high school, delayed the onset of smoking tobacco in both males and females, and was associated with an increased likelihood of high school graduation and a lower likelihood of special education use. While broad benefits of this intervention have been found, the effects of the CC Intervention are strongest for males who exhibit a relatively high level of aggressive-disruptive behavior in the early elementary school years, indicating that this universal intervention can have a targeted impact on a high-risk group of children. In a study of the Good Behavior Game, males in the intervention group who were more aggressive in 1st grade had higher rates of high school graduation, lower rates of alcohol and drug abuse and dependence, and lower rates of antisocial personality disorder at ages 19 to 21 than males in the control condition (Bradshaw et al., 2009; Wang et al., 2012). Linking the Interests of Families and Teachers (LIFT). LIFT is a universal preventive intervention that was developed for elementary schools in communities with high levels of juvenile delinquency. Created for students in the 1st and 5th grades, LIFT is a multi-component intervention that is designed to improve school and family environments while also reinforcing stronger links between the two. Two school components are designed to decrease the likelihood of both aggressive child behavior and rejection of aggressive children by their peers: A classroom component improves upon social and problem-solving skills during 20 1-hour-long sessions, and a playground component based on the Good Behavior Game (see the "CC Intervention") reinforces positive social behaviors during free (unstructured) play. There is also a parent management training component emphasizing good discipline, supervision, and problem-solving during a group meeting, once a week for 6 weeks, as well as parent support between sessions. In addition, a school-parent communication component supports connections between the families and teachers through phone, email, and Internet, as well as a weekly newsletter sent to parents describing the LIFT activities of the week and suggesting complementary home activities. Within the context of a randomized controlled trial of 12 schools, LIFT resulted in improvements in parenting behaviors and child social skills as well as reduced child physical aggression on the playground. During their middle and high school years, children in schools assigned to the LIFT intervention had lower rates of police arrest and substance use compared to children in control schools (DeGarmo et al., 2009; Eddy et al., 2000). Raising Healthy Children (RHC). RHC is a school- and home-based intervention targeting children in grades 1 through 12. 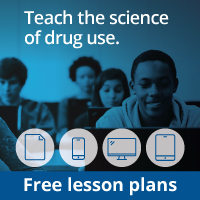 It engages classroom teachers, parents, and students with the goal of increasing pro-social behavior and reducing substance use and other problem behavior by addressing developmentally salient risk and protective factors. Teachers attend workshops to improve instruction and classroom management practices and have access to one-on-one classroom-based coaching to help them implement the techniques they have learned. Parents participate in parenting workshops and brief, individual, in-home sessions as students approach critical transitions in adolescence. Children learn social, emotional, and cognitive skills through classroom, after-school, and parent-youth sessions. In addition, families have access to school-home coordinators (SHCs) who check in with families several times a year and help solve problems that arise. Students who participated in the RHC intervention showed higher academic performance, a stronger commitment to school, and increased social competency. They also showed lower levels of antisocial behavior and less frequent alcohol and marijuana use, and were less likely to drive under the influence of alcohol or ride with someone who had been drinking alcohol. Reductions in driving under the influence and riding with another driver under the influence were sustained through age 20. As such, the RHC intervention has been shown to promote healthy behaviors and academic achievement, reduce substance use and antisocial behaviors, and reduce drunk driving (Brown et al., 2005; Haggerty et al., 2006). SAFEChildren. SAFEChildren is a universal intervention with school and family components developed specifically for 1st graders from urban, disadvantaged, or low-income neighborhoods. This program is designed to help families protect their children from the risks of growing up in communities with high levels of poverty and crime and few social and economic resources. SAFEChildren also specifically focuses on helping inner-city parents manage a child’s transition to school with the goal of promoting academic achievement and overall child well-being. The family component brings multiple families together in a group setting once a week for 22 weeks. During these meetings, families receive information about parenting skills, family relationships, and understanding and managing developmental and situational challenges. In addition, there are opportunities to practice skills and solve problems as a group. These multiple-family groups increase support among parents and help families become more engaged with the school and more engaged in managing issues such as problems in the neighborhood. The school component consists of a tutoring program that takes place twice weekly for 22 weeks and emphasizes phonetics as well as a step-by-step advancement in academic skills. The SAFEChildren intervention has been shown to improve reading level overall. Among higher-risk families, characterized by poorer family relationships and parenting practices, the SAFEChildren intervention led to improved parental monitoring and reduced child aggression. Furthermore, higher-risk children, characterized by greater aggression and hyperactivity as well as poorer concentration, showed greater reduction in aggression and hyperactivity as well as improved leadership skills. Also, SAFEChildren had an effect on ADHD symptoms from first grade to fourth grade, with intervention children less likely to be rated as high on impulsivity and hyperactivity, over this time frame (Fowler et al., 2014). An additional version of SAFEChildren was developed for 4th grade to deliver booster sessions. Those assigned to the booster showed lower rates of aggression than those with only 1st-grade intervention (Tolan et al., 2009). Seattle Social Development Project (SSDP). SSDP is a universal intervention for elementary school children with a school component and voluntary family component, developed to increase pro-social bonds, strengthen attachments to school, and decrease delinquency. The family component consists of parenting classes that cover family management (1st and 2nd grade), engagement in a child’s education (2nd and 3rd grade), and the drug abuse prevention program Preparing for the Drug Free Years (PDFY) (5th and 6th grade). In the school component, teachers are trained to establish clear rules and reward compliance, teach interactively, and promote cooperative learning in small groups. The goal is to increase the students’ academic performance as well as social skills and increase contact with pro-social peers. In addition, children are taught interpersonal problem-solving skills to improve communication, decision-making, negotiation, and conflict resolution. SSDP is the original intervention that serves as the basis for the Raising Healthy Children (RHC) intervention. The SSDP intervention was associated with reduced aggressive behavior in males and reduced self-destructive behavior in females. It has also been shown to reduce delinquency and alcohol use for both males and females. Females were also less likely to have smoked cigarettes and somewhat less likely to have tried marijuana. Further, there is evidence that SSDP increases attachment to school, cooperative learning, and academic achievement. Intervention effects were strongest among children from lower income households. Long-term effects of the SSDP intervention found that those children who received the intervention had less risky sexual behavior (fewer partners, sexually transmitted infections, and pregnancies, and more condom use), were more likely to graduate high school, were more likely to become gainfully employed, and have less involvement with the criminal justice system (Hawkins et al., 2008). Early Risers “Skills for Success” Risk Prevention Program. Early Risers is an intervention for children at higher risk for the development of serious conduct problems, including the use and misuse of drugs. Elementary school-aged children ages 6 to 10 are selected for the program based on the presence of risk factors including exposure to stressful life experiences and/or early aggressive and disruptive behavior. The program is designed to deflect children from the “early starter” developmental pathway toward normal development by improving their academic competence and behavioral self-regulation and encouraging positive peer affiliations. The program also teaches parenting practices that include discipline, nurturance, and involvement. The Early Risers intervention model includes two child-focused components and two parent- or family-focused components delivered over a 2- to 3-year period. The program includes standard skills curricula as well as strategies tailored to address the individual needs and goals of children and their parents. In efficacy and effectiveness trials of Early Risers, program participants have demonstrated greater gains in social skills, peer reputation, pro-social friendship selection, academic achievement, and parent discipline than did controls. The program has been replicated with African-American children. Findings from a 6-year follow-up indicated that the gains in social skills and parent discipline observed early on accounted, in part, for fewer oppositional defiant disorder symptoms among program participants compared with controls in middle school. Recently, in a going-to-scale trial, Early Risers was implemented with high fidelity across 28 school sites, and children made positive gains on outcomes similar to those found in the efficacy trial (August et al., 2003). Kids in Transition to School (KITS). KITS is a selective prevention intervention designed to enhance psychosocial and academic readiness in children in the foster care system as they enter school by promoting pre-literacy skills and increasing their attention, effortful control, and social skills in classroom settings. The program gives caregivers skills for facilitating their children's successful transition to kindergarten and becoming involved in their children’s schooling. The KITS intervention targets specific school-related skills during the summer before and the first weeks of kindergarten via a therapeutic playgroup; caregiver psycho-educational support groups; and behavioral consultation in the home, school, and community settings. Recent findings from a randomized controlled trial of KITS showed positive effects on outcomes in childhood that are linked to later risk for drug use. Children who received the KITS intervention had lower levels of oppositional and aggressive behaviors in the classroom. Also, there were positive intervention effects on early literacy and self-regulatory skills (Pears et al., 2013; Pears et al., 2012). Fast Track Prevention Trial for Conduct Problems. Fast Track is a tiered comprehensive preventive intervention delivered in grades 1 through 10 to children at high risk for long-term antisocial behavior. Based on a developmental model, the intervention includes a universal classroom program (adapted from the Promoting Alternative Thinking Strategies [PATHS] curriculum) delivered in elementary school. This classroom intervention builds skills in emotional understanding and communication, friendship, self-control, and social problem-solving. In addition, the program includes selective interventions for high-risk children displaying elevated aggression at home and school, as assessed in kindergarten. These high-risk children receive social skills training and academic tutoring, and their parents receive group parent training and individual home visits. Child-focused skill training targets academic and social competencies as well as self-control skills. Parent training builds parents’ self-control and targets skills to support the child’s school adjustment, improve the child’s behavior, promote appropriate expectations for the child’s behavior, and improve parent-child interaction. By the end of 12th grade, the Fast Track intervention was found to reduce adolescent delinquency as indicated by youth self-reports and official arrest records and, for the youths at highest risk, to reduce lifetime prevalence for conduct disorder, oppositional defiant disorder, attention deficit hyperactivity disorder, and any externalizing disorder. At the end of elementary school, children in Fast Track were found to have significantly reduced home and community problems, which included past-year involvement in substance use behaviors. There was no significant effect of the intervention on the onset of delinquent acts that included selling controlled substances. By the end of 12th grade, children in Fast Track had significantly fewer visits to general health providers, pediatric providers, and emergency departments for emotional, behavioral, academic, drug, or alcohol problems. At age 25 years, assignment to intervention significantly decreased the probability of alcohol abuse, marginally decreased binge drinking, did not affect heavy marijuana use, and significantly decreased serious substance use (Conduct Problems Prevention Research Group, 2011; Conduct Problems Prevention Research Group, 2015). Incredible Years® Parents, Teachers, and Children’s Training Series. The Incredible Years series is a tiered, multi-component prevention and treatment intervention implemented in day care, preschool (2 to 5 years), and early primary grades (6 to 8 years). The prevention version of the program can be offered in high-risk schools or day care centers to all parents, teachers, and children; or parents and teachers may identify children at moderate or higher risk based on elevated behavior problem ratings. The treatment version is used for children identified as having behavioral or conduct problems. The comprehensive intervention consists of a parent training component as well as school-based teacher training and child training components. The Incredible Years parenting program instructs parents in child-directed play, academic and persistence coaching, social and emotional coaching, use of praise and tangible incentives, and positive discipline methods that promote positive relationships and strengthen children’s language development, social and emotional competence, school readiness skills, problem-solving, and anger management. Different parent curricula are available for different child developmental stages and teach parents how to partner with day care providers and teachers to develop individualized behavior plans. The program consists of weekly, 2-hour parent group meetings with a group leader and/or counselor for a total of 14 to 18 sessions or more. The number of sessions varies according to the child’s age, the parent’s needs, and whether the prevention or treatment version of the program is being used. The Incredible Years child program, also called the Dina Dinosaur Social Skills Program for young children (Dinosaur School), teaches children school rules, strategies for success in school, feelings literacy, empathy training and emotional regulation, problem-solving skills, and friendship skills. The prevention version of this program can be delivered by classroom teachers throughout the school year two to three times per week, with structured circle time lesson plans and hands-on small group activities. The program uses developmentally appropriate lesson plans for children in preschool through 2nd grade (3 to 8 years old). The Incredible Years teacher classroom management program trains teachers in effective classroom management strategies as well as ways to collaborate with parents to promote consistency of learning from school to home. This program can be delivered to all teachers in a school or to selected teachers who have particularly challenging children in their classrooms. The training is group-based and delivered in six day-long sessions once a month throughout the year, accompanied by individual coaching within the schools. Each of the Incredible Years programs has been researched in their prevention and treatment versions. Parent programs consistently result in higher rates of positive parenting behaviors and fewer child behavior problems at home. The child program results in improved social interactions and problem-solving with peers, increased in-school readiness behaviors, and decreased aggression and negative behavior with peers. The teacher program results in increased use of positive classroom management strategies, less negative or critical teaching, more focus on providing children with social emotional curriculum, and increased home-school collaboration (Webster-Stratton & Reid, 2010; Webster-Stratton et al., 2004). Positive Action (PA). The PA intervention is a tiered, multi-component, school-based, social-emotional and character development program designed to improve academics and pro-social behaviors as well as decrease problem behaviors. Components of this intervention target the classroom and the overall school climate as well as families and the community. The classroom component consists of grade-specific curricula, which can be implemented beginning as early as Pre-K and extending through grade 12. The lessons cover six broad categories: self-concept, physical and intellectual actions, social/emotional actions for managing oneself responsibly, getting along with others, being honest with oneself and others, and continuous self-improvement. The overall school climate supports the classroom curriculum through ongoing reinforcement of positive behaviors, posters, assemblies, newsletters, and other means. In addition, school counselors work with selected higher-risk students and families to develop PA skills. The family component provides caregivers with resources that parallel the classroom curricula to further reinforce the messages children are receiving at school. The PA intervention also helps establish media messages and civic engagement activities for the larger community in which the children live. Children who participated in the PA program had improved academic achievement and lower rates of substance use, violence, sexual activity, and absenteeism. Furthermore, the effects of PA on child outcomes increase with multiple years of exposure to the program (Beets et al., 2009; Flay & Allred, 2010; Snyder et al., 2010). School and Homes in Partnership (SHIP). The SHIP intervention is a tiered intervention for children in kindergarten through 3rd grade who have aggressive behavior problems or reading difficulties. It is implemented over the course of 2 academic years and includes parent training, a social behavior intervention, and reading instruction. The parent training component is administered in either Spanish or English and consists of the Incredible Years parenting program delivered over 12 to 16 sessions. There are two components to the social behavior intervention. The first component, Contingencies for Learning Academic and Social Skills (CLASS), involves the child working directly with a trained consultant, then the teacher, and lastly the teacher and parents to reduce acting out and improve appropriate classroom behavior. The second component is the Dina Dinosaur Social Skills Program (see "Incredible Years"), a 2-hour after-school program using puppets and video tapes to model appropriate behavior to children. The reading instruction component consists of daily small-group instruction in phonemic awareness, sound-letter correspondence, and blending. Additional instruction is provided for those students who are still non-readers in the 3rd and 4th grades. SHIP has been evaluated among both European-American and Hispanic children. It was found to reduce aggressive or anti-social behavior, particularly for those children with early aggressive behavior problems. SHIP has also been found to improve reading abilities (Gunn et al., 2005; Smolkowski et al., 2005). August GJ, Lee SS, Bloomquist L, Realmuto GM, Hektner JM. Dissemination of an evidence-based prevention innovation for aggressive children living in culturally diverse, urban neighborhoods: the Early Risers effectiveness study. Prev Sci. 2003;4(4):271-286. August GJ, Realmuto GM, Hektner JM, Bloomquist ML. An integrated components preventive intervention for aggressive elementary school children: the Early Risers Program. J Consult Clin Psychol. 2001;69(4):614-626. Barlow A, Mullany M, Neault N. Effect of a paraprofessional home visiting intervention on American Indian teen mothers’ and infants’ behavioral risks: a randomized controlled trial. Am J Psychiatry. 2012;170(1):83-93. Barlow A, Varipatis-Baker E, Speakman K, et al. 2006. Home-visiting intervention to improve child care among American Indian adolescent mothers: a randomized trial. Arch Pediatr Adolesct Med. 2006;160(11):1101-1107. Barrera M, Jr, Biglan A, Taylor TK, et al. Early elementary school intervention to reduce conduct problems: a randomized trial with Hispanic and non-Hispanic children. Prev Sci. 2002;3(2):83-94. Battistich V, Schaps E, Watson M, Solomon D, Lewis C. Effects of the Child Development Project on students’ drug use and other problem behaviors. J Prim Prev. 2000;21(1):75-99. Battistich V, Solomon D, Watson M, Schaps E. Caring school communities. Educ Psychol. 1997;32(3):137-151. Beets MW, Flay BR, Vuchinich S, et al. Use of a social and character development program to prevent substance use, violent behaviors, and sexual activity among elementary-school students in Hawaii. Am J Public Health 2009;99(8):1438-1445. Bradshaw C, Zmuda J, Kellam S, Ialongo N. Longitudinal impact of two universal preventive interventions in first grade on educational outcomes in high school. J Educ Psychol. 101(4):926–937, 2009. Brown EC, Catalano RF, Fleming CB, Haggerty KP, Abbott RD. Adolescent substance use outcomes in the Raising Healthy Children project: a two-part latent growth curve analysis. J Consult Clin Psychol. 2005;73(4):699-710. Catalano RF, Mazza JJ, Harachi TW, Abbott RD, Haggerty KP, Fleming CB. Raising healthy children through enhancing social development in elementary school: results after 1.5 years. J Sch Psychol. 2003;41(2):143-164. Conduct Problems Prevention Research Group. Impact of early intervention on psychopathology, crime, and well-being at age 25. Am J Psychiatry. 2015;172(1):59-70. Conduct Problems Prevention Research Group. Merging universal and indicated prevention programs: the Fast Track model. Addict Behav. 2000;25(6):913-927. Conduct Problems Prevention Research Group. The effects of the Fast Track preventive intervention on the development of conduct disorder across childhood. Child Dev. 2011;82(1):331-345. DeGarmo DS, Eddy JM, Reid JB, Fetrow RA. Evaluating mediators of the impact of the Linking the Interests of Families and Teachers (LIFT) multimodal preventive intervention on substance use initiation and growth across adolescence. Prev Sci. 2009;10(3):208-220. Dishion TJ, Connell AM, Weaver CM, Shaw DS, Gardner F, Wilson MN. The Family Check-Up with high-risk indigent families: preventing problem behavior by increasing parents’ positive behavior support in early childhood. Child Dev. 2008;79(5):1395-1414. Dodge KA, Goodman WB, Murphy R, O’Donnell K, Sato J. Toward population impact from home visiting. Zero Three. 2013;33(3):17-23. Dodge KA, Goodman WB, Murphy RA, O’Donnell K, Sato J. Randomized controlled trial evaluation of universal postnatal nurse home visiting: impacts on child emergency medical care at age 12-months. Pediatrics. 2013;132:S140-S146. Eddy JM, Reid JB, Fetrow RA. An elementary-school based prevention program targeting modifiable antecedents of youth delinquency and violence: linking the Interests of Families and Teachers (LIFT). J Emot Behav Disord. 2000;8(3):165-176. Fisher PA, Chamberlain P. Multidimensional treatment foster care: a program for intensive parent training, family support, and skill building. J Emot Behav Disord. 2000;8:155-164. Fisher PA, Kim HK, Pears KC. Effects of Multidimensional Treatment Foster Care for Preschoolers (MTFC-P) on reducing permanent placement failures among children with placement instability. Child youth Serv Rev. 2009;31(5):541-546. Fisher PA, Stoolmiller M, Gunnar MR, Burraston BO. Effects of a therapeutic intervention for foster preschoolers on diurnal cortisol activity. Psychoneuroendocrinology. 2007;32(8–10):892-905. Flay BR, Allred, CG. The Positive Action Program: improving academics, behavior, and character by teaching comprehensive skills for successful learning and living. In: Lovat T, Toomey R, Clement N, eds. International Research Handbook on Values Education and Student Wellbeing. New York, NY: Springer; 2010:471-501. Flay BR, Allred CG, Ordway N. Effects of the Positive Action program on achievement and discipline: two matched-control comparisons. Prev Sci. 2001;2(2):71-89. Fowler PJ, Henry DB, Schoeny M, Gorman-Smith D, Tolan PH. Effects of the SAFE Children preventive intervention on developmental trajectories of attention-deficit/hyperactivity disorder symptoms. Dev Psychopathol. 2014;26(4Pt 1): 1161-1179. Gunn B, Smolkowski K, Biglan A, Black C, Blair J. Fostering the development of reading skill through supplemental instruction: results for Hispanic and non-Hispanic students. J Spec Educ. 2005;39(2):66-85. Haggerty KP, Fleming CB, Catalano RF, Harachi TW, Abbott RD. Raising healthy children: examining the impact of promoting healthy driving behavior within a social development intervention. Prev Sci. 2006;7(3):257-267. Hawkins JD, Catalano RF, Kosterman R, Abbott RD, Hill KG. Preventing adolescent health-risk behaviors by strengthening protection during childhood. Arch Pediatr Adolesc Med. 1999;153(3):226-234. Hawkins JD, Kosterman R, Catalano R, Hill KG, Abbott RD. Effects of social development intervention in childhood 15 years later. Arch Pediatr Adolesc Med. 2008;162(12):1133-1141. Kellam SG, Rebok GW. Building developmental and etiological theory through epidemiologically based preventive intervention trials. In: McCord J, Tremblay RE, eds. Preventing Antisocial Behavior: Interventions from Birth through Adolescence. New York, NY: Guilford Press; 1992:162-195. Kitzman H, Olds D, Cole R, et al. Enduring effects of prenatal and infancy home visiting by nurses on children: follow-up of a randomized trial among children at age 12 years. Arch Pediatr Adolesc Med. 2010;164(5):412-418. Mullany B, Barlow A, Neault N, et al. The Family Spirit Trial for American Indian teen mothers and their children: CBPR rationale, design, methods, and baseline characteristics. Prev Sci. 2012;13(5):504-518. Olds DL, Kitzman H, Cole R, et al. Enduring effects of prenatal and infancy home visiting by nurses on maternal life course and government spending: follow-up of a randomized trial among children at age 12 years. Arch Pediatr Adolesc Med. 2010;164(5):419-424. Olds DL. Prenatal and infancy home visiting by nurses: from randomized trials to community replication. Prev Sci. 2002;3(3):153-172. Pears KC, Fisher PA, Heywood CV, Bronz KD. Promoting school readiness in foster children. In: Saracho ON, Spodek B, eds. Contemporary Perspectives on Social Learning in Early Childhood Education. Charlotte, NC: Information Age Publishing; 2007:173-198. Pears KC, Fisher PA, Kim HK, Bruce J, Healey CV, Yoerger K. Immediate effects of a school readiness intervention for children in foster care. Early Educ Dev. 2013;24(6):771-791. Pears KC, Kim HK, Fisher PA. Effects of a school readiness intervention for children in foster care on oppositional and aggressive behaviors in kindergarten. Child Youth Serv Rev. 2012;34(12):2361-2366. Reid JB, Eddy JM, Fetrow RA, Stoolmiller M. Description and immediate impacts of a preventive intervention for conduct problems. Am J Community Psychol. 1999;27(4):483-517. Shaw DS, Dishion TJ, Supplee L, Gardner F, Arnds K. Randomized trial of a family-centered approach to the prevention of early conduct problems: 2-year effects of the family check-up in early childhood. J Consult Clin Psychol. 2006;74(1):1-9. Smolkowski K, Biglan A, Barrera M, Taylor T, Black C, Blair J. Schools and Homes in Partnership (SHIP): long-term effects of a preventive intervention focused on social behavior and reading skill in early elementary school. Prev Sci. 2005;6(2):113-125. Snyder FJ, Vuchinich S, Acock A, et al. Impact of the Positive Action program on school-level indicators of academic achievement, absenteeism, and disciplinary outcomes: a matched-pair, cluster randomized, controlled trial. J Res Educ Eff. 2010;3(1):26-55. Tolan P, Gorman-Smith D, Henry D. Supporting families in a high-risk setting: proximal effects of the SAFEChildren preventive intervention. J Consult Clin Psychol. 2004;72(5):855-869. Tolan PH, Gorman-Smith D, Henry D, Schoeny M. The benefits of booster interventions: evidence from a family-focused prevention program. Prev Sci. 2009;10(4): 287-297. Wang Y, Storr CL, Green KM, et al. The effect of two elementary school-based prevention interventions on being offered tobacco and the transition to smoking. Drug and Alcohol Depend. 2012;120(1–3):202-208. Webster-Stratton C, Reid MJ, Hammond M. Treating children with early-onset conduct problems: intervention outcomes for parent, child, and teacher training. J Clin Child Adolesc Psychol. 2004;33(1):105-124. Webster-Stratton C, Reid MJ, Stoolmiller M. Preventing conduct problems and improving school readiness: evaluation of the Incredible Years Teacher and Child Training Programs in high-risk schools. J Child Psychol Psychiatry. 2008;49(5):471-488. Webster-Stratton C, Reid MJ. The Incredible Years Parents, Teachers and Children Training Series: a multifaceted treatment approach for young children with conduct problems. In: Kazdin AE, Weisz JR, eds. Evidence-Based Psychotherapies for Children and Adolescents. 2nd ed. New York, NY: Guilford Publications; 2010. Chapter 1: Why is Early Childhood Important to Substance Abuse Prevention? NIDA. "Principles of Substance Abuse Prevention for Early Childhood." National Institute on Drug Abuse, 9 Mar. 2016, https://www.drugabuse.gov/publications/principles-substance-abuse-prevention-early-childhood. NIDA. Principles of Substance Abuse Prevention for Early Childhood. National Institute on Drug Abuse website. 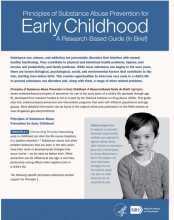 https://www.drugabuse.gov/publications/principles-substance-abuse-prevention-early-childhood. March 9, 2016.